The Jordanian Anti Money Laundering and Counter Terrorist Financing Unit (AMLU), in cooperation with the Danish Ministry of Foreign Affairs and its implementing partner, the Global Center, held an information sharing roundtable discussion regarding experiences in conducting a money laundering and terrorist financing (ML/TF) national risk assessment (NRA) with representatives from international financial intelligence units (FIUs) and relevant Jordanian authorities. H.E. Mrs. Dana Junbulat, Chief of AMLU of The Hashemite Kingdom of Jordan delivered opening remarks. The Financial Action Task Force (FATF) Recommendation 1 emphasizes risk assessment and calls on jurisdictions to conduct an ML/TF NRA. While FATF endorses no particular methodology to assess these risks, the International Monetary Fund (IMF) and the World Bank have both developed comprehensive NRA methodologies which have been used by several countries. Other countries have used methodologies developed in house. During the roundtable, Jordanian authorities held discussions with representatives of the IMF, World Bank, and from the FIUs of Lebanon, Belgium, and Denmark on best practices for conducting NRAs, the challenges typically encountered in the process, and recommendations for overcoming those challenges. 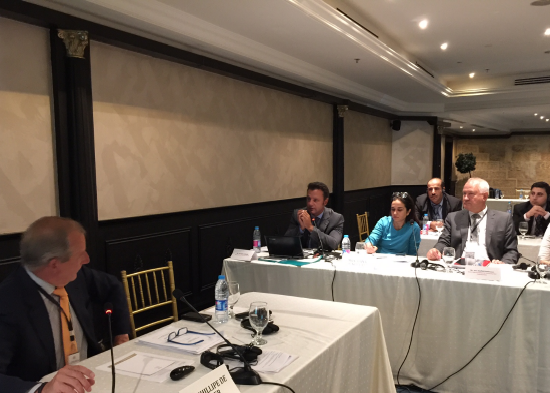 The roundtable discussion was the first in a series of activities facilitated by Denmark and partners in the Middle East and North Africa region—particularly Jordan, Lebanon, and Iraq—to reinforce their work and partnership in the context of the Counter ISIL Finance Group. Arabic coverage of this event is available on the Jordanian AMLU website. For additional information about the workshop or this project please contact Ms. Danielle Cotter: dcotter@globalcenter.org.